As part of Sydney Contemporary art fair, a giant walk-in camera obscura will set up shop at the front of Carriageworks for four days – allowing visitors to see how this early photo technology works. 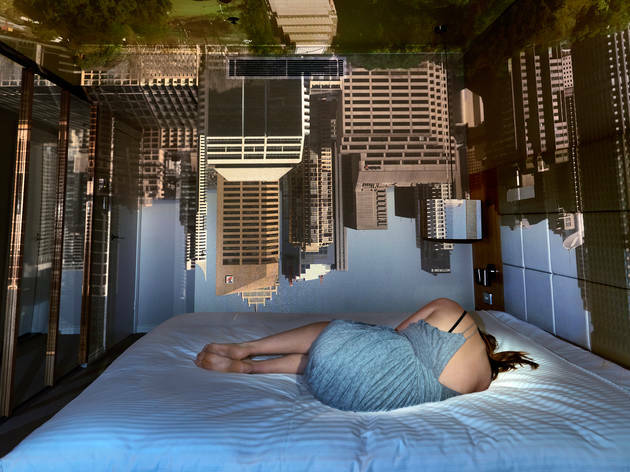 Called Double Take, the work is by artist Robyn Stacey, and follows similar works in which she has used a room-sized camera obscura to create haunting images in which the exterior world is projected, in inverted form, onto the interior walls, ceiling and floor of a room. Stacey writes, “I was fascinated by the ability of the simplest and earliest form of optical device to transform the interior of rooms by projecting the outside world via a small hole over the walls, ceiling and floor of the room. 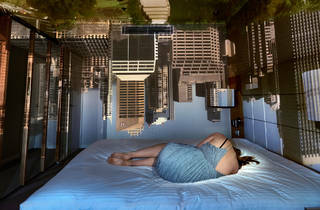 As light travels in a straight line the room is wallpapered with the upside down and reverse view of external vistas, creating darkrooms of dramatically projected landscapes." Read about how it works, and what you'll see inside the 'dark room'. Entry is free but must be booked in advance. Sat tickets here; Sun tickets here.